I am a reluctant and unlikely spokesperson for love. I am a pessimist by nature. I have watched many long-term relationships crumble. My own family is riddled with divorce, alcoholism, and abuse. Depression is a daily reality for me and I know that I am not easy to put up with. I do not understand or subscribe to romance. I think it often belittles the true love that motivates small daily gestures. It too often clouds the reality of a relationship – the lack of solid foundation, the acts of cruelty, the lack of common goals and interests. Then again, my mom is a shining example of unconditional love and support. Unlike other people I know, I do not have to hide who I am. And I have many friends who are fiercely devoted parents. My partner*, Kelly, – who is my partner in all senses of the word – has also shown me what love really is and that it is possible. It is kindness, support, enjoyment, understanding. It is quiet and dependable. I am fighting for recognition and respect for all types of families – blended families, queer families, multi-racial families, adoptive families, families of choice, childless and child-free families, single people, and many more. I am fighting for the right to marry my partner so that we will enjoy the same protections that other couples take for granted. Heck, if someone can come up with a better system that will allow for greater flexibility and protection for all types of families, then I will fight for that too. In honor of all of those out there making the world better through love – romantic love, parental love, platonic love, fraternal love, service to others, compassion, understanding, and any other kind of love – please send in your photos, words, videos, or anything else that shows what love means to you of how you and/or your loves ones are making love a radical act. Do not feel obligated to only share the happy stories – sometimes love is hard and painful – but do refrain from hurtful or oppressive language. This blog is meant to be a safe space. 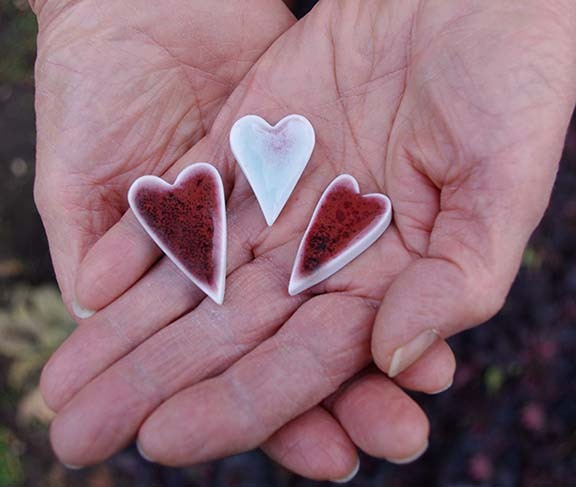 To be part of our interactive collaborative installation project, either watch the events list to join us in person or order your own ceramics heart(s) here. Hang the heart where you feel it should be, take a photo, and then email the photo to loveisaradicalact [at] gmail [dot] com with any info you would like to share about the location of the heart or your experience participating in the project. Thank you to everyone who is making the world a better place by engaging in the radical act of love. *I never liked the term “partner” as a label for one’s significant other until I was with Kelly. It’s still problematic insofar as we have to use it by default rather than by choice, but at least I see the truth in it now. it is beautiful !!! be happy always !!! How does one make a submission??? Email your submission to loveisaradicalact [at] gmail [dot] com and we’ll get it posted ASAP!